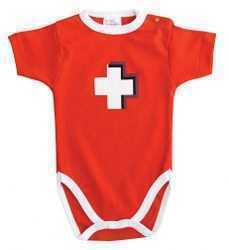 Red w/black trim Onesie with a floral design on the front resembling the traditional milking shirt. 100% cotton. Toddler size: 9 months or 12 months. 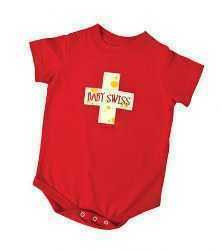 White w/red trim onesie with an Appenzell Vest print design. 100% cotton. 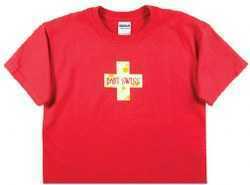 Toddler sizes: 3, 9, or 18 months. 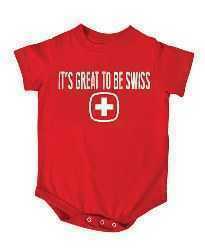 Red “It’s Great to be Swiss” Onsie. 100% cotton. 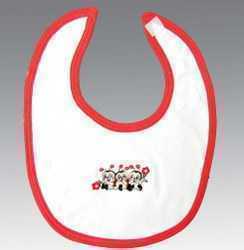 Get the matching onesies & bib set. Cute, cute, adorable! Get the matching onesies.